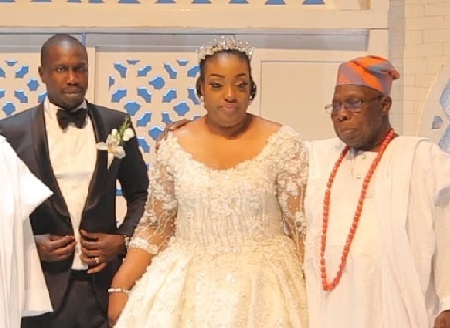 The former President's Son wedded to Tope Adebutu, a daughter of Chief Kessington Adebutu, the founder of the popular lotto firm called "Baba Ijebu"
The wedding which was held on May 13th, 2017 was shunned by his mother, Mrs. Taiwo Obasanjo who had earlier objected to the date of the wedding and it elaborate nature. Fresh reports according to The Sun Newspaper has it that Olajuwon has since November ran out of the marriage since last year November to an unknow destination. The marriage crash was confirmed by Mr. Taiwo Obasanjo in an interview with the Sun Newspaper. The Mother, however, denied knowledge of her son's whereabouts. The wife, according to Mrs. Obasanjo has also walked out of their matrimonial home and now lived her mother in Ikoyi. Mrs. Obasanjo said strange thing began to befall the marriage when the mother-in-law demanded on the wedding to go to honeymoon with the wedded couple. "...From the first day of the wedding, the mother of the girl said she wanted to go on honeymoon with my son and his wife, which I have never heard of in my whole life. Whether I am lying my son can testify about that. The mother insisted that she must go on a honeymoon. I wasn’t there, but I heard that later. My son defied my advice and the advice of the living God because I didn’t go soliciting for prophecy for him. The one about the wedding came on its own. I never went to anybody to kneel down and asked to be prayed for. This message came voluntarily. For spiritual messages you don’t go soliciting, that means there are powerful truths behind it" Mrs. Obasanjo told Sunday Sun in the interview. Mrs. Obasanjo had opposed the wedding of her son, Olujonwon to Tope Adebutu, daughter of Chief Kessington Adebutu on the grounds of the choice of the date picked for the event. She had claimed that Olunjowon who turns 34 on June 1, 2017, according to a prophecy, was forbidden from celebrating any elaborate wedding until he clocks 34. Mrs. Obasanjo in a letter dated April 28, 2017 to the Prelate, Methodist Church of Nigeria, His Eminence Dr, Samuel C.K Uche had called on the church to probe what she described as “questionable, suspicious and rigidity of the 11th and 13th of May, 2017 chosen for the wedding of my son, Abraham Olujonwon to Tope Adebutu of Sir Kessington Adebutu”. She claimed to have met with Mrs. Adebutu and her daughter on three occasions in October 2016 to inform them about the prophecy which forbade her son from celebrating an elaborate wedding until he attains the age of 34. “In the month of October 2016, thrice I went to see Mary Dacosta and her daughter, Tope Adebutu at home to hold meetings with them and with respect I told them about the prophecy given to me on three occasions two to three years back, that any time Olujowon wants to get married, it should be done quietly with no noise, that elaborate wedding should be done after he turns 34 on the 1st of June… I was ridiculed by Rosemary Dacosta and her daughter, saying there is nothing I can do, that the wedding would go on before 1st of June, 2017,” she claimed. Mrs. Obasanjo also claimed to have equally appealed to Chief Adebutu in January over the issue without any success.